Now in its eight year, the Brooklyn Folk Festival kicks off tomorrow at St. Ann’s Church. Over the course of the three-day schedule, artists such as Michael Hurley, Spirit Family Reunion and Jerron “Blind Boy” Paxton are set to perform. In conjunction with the festival, Jalopy Records is issuing Lost Train Blues: John & Alan Lomax and the Early Folk Music Collections at the Library of Congress, a new collection of 22 songs from the vast holdings of the American Folklife Center at the Library of Congress. 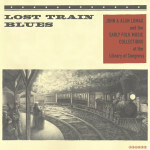 Featuring work songs, ballads, blues, political and union songs, guitar, banjo and fiddle music and Native American vocal music recorded between 1933 and 1950, Lost Train Blues was curated by Brooklyn Folk Festival producer Eli Smith and compiled for the centennial of famed folklorist Alan Lomax’s birth. Twelve of the 22 songs on the collection have never before been released, including “Rye Whiskey” by Texas rancher and fiddler Elmo Newcomer. Recorded by John and Ruby Lomax near Newcomer’s Pipe Creek home in Bandera County, Texas on 3 May 1939, Bucket Full of Nails is proud to premiere “Rye Whiskey” which you can stream below. Lost Train Blues can be pre-ordered on vinyl via Bandcamp.